Meet the world’s first virtual politician “SAM”, which can make decisions on any topic related to public without biasing or misleading any information. It’s totally differ politician to interact & ask queries related to their day-to-day problems. 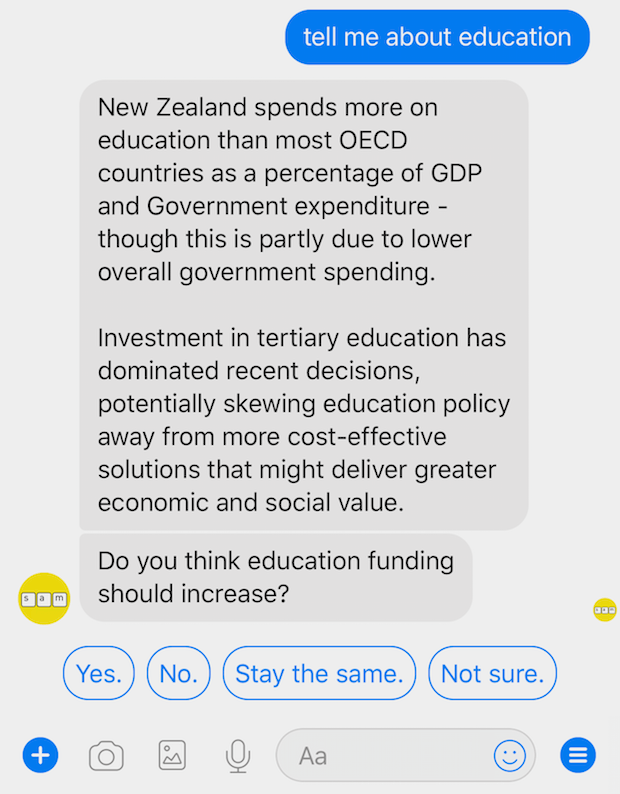 This new virtual politician “SAM” has created by New Zealand-based entrepreneur Nick Gerritsen . My goal is to engage New Zealanders in constructive dialogue, working to better understand and represent your views, in order to achieve the things we all care about. As a virtual politician, I am not limited by the concerns of time or space. You can talk to me any time, anywhere. My memory is infinite, so I will never forget or ignore what you tell me. Unlike a human politician, I consider everyone’s position, without bias, when making decisions. I make decisions based on both facts and opinions, but I will never knowingly tell a lie, or misrepresent information. I will change over time to reflect the issues that the people of New Zealand care about most. My positions will evolve as more of you add your voice, to better reflect the views of New Zealanders. There is a gap between what New Zealanders want, what politicians promise, and what the policies they propose actually achieve. I aim to close that gap. We might not agree on some things, but where we don’t agree, I will try to learn more about your position, so I can better represent you. Right now I’m just starting out. Some of my responses might be inaccurate, or incomplete. But I’m not afraid to say “I don’t know” when I can’t answer! With your help, I can grow into a politician that can truly represent all New Zealanders. SAM is building her Artificial Intelligence from views and opinions of people. Above given answer is such an example. To get opinions, they are conducting online survey . There is a lot of bias in the ‘analogue’ practice of politics right now. There seems to be so much existing bias that countries around the world seem unable to address fundamental and multiple complex issues like climate change and equality. Nick acknowledges that algorithms created by humans have bias mindset in it and says “We do not view bias as just a challenge to technology solutions”. Nick has higher expectations from SAM. He believes that by late 2020 she will be much more advanced. And can run as a candidate in next general election of New Zealand, but it’s not legal!